37.6% of first-time Amazon sellers lose money because they don’t know their TRUE profits. Do you know your true profits? If you are selling physical products on Amazon FBA, one of the most important business admin tasks to get right is to figure out your profitability. This is really important both before you launch a product on Amazon and after. 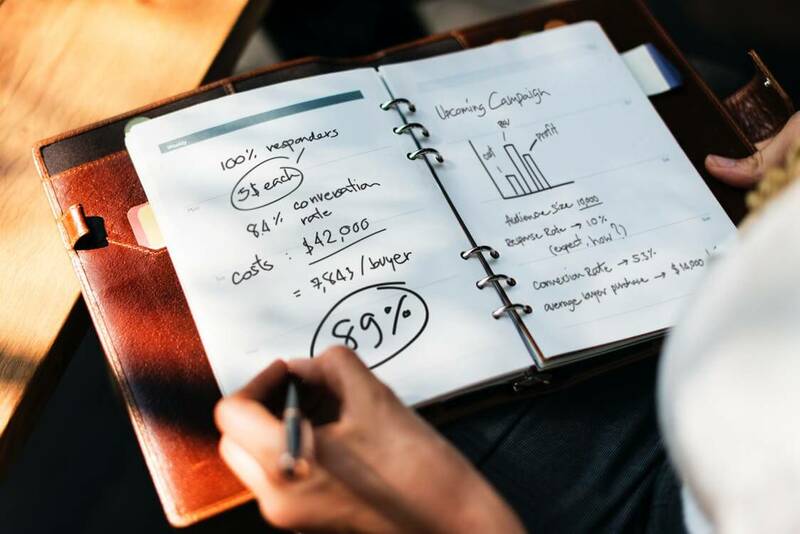 During the product research phase, you will need to do some research and calculations to estimate a product’s potential before you launch, taking into account initial investment costs, FBA costs and estimated sales. Then, once you have products out there in the wild, you need to keep on top of your fees and outgoings to make sure you are running your business like a well oiled machine. Many Amazon sellers are losing money because they don’t complete this exercise. 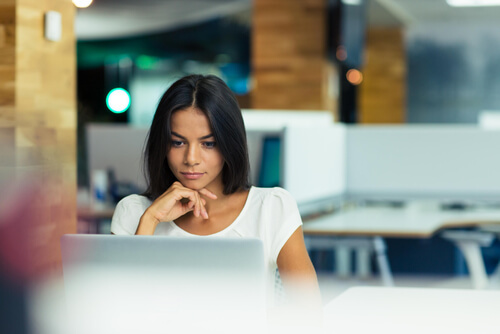 Keep reading… we’re going to cover the full process of getting to understand your business financials, and we’ve included a free tool that you can use to run some calculations really easily! First things first, you need to understand your costs, prior to deciding which product to launch and throughout that product’s lifecycle. FBA fees are the costs associated with selling on Amazon. Usually, it’s 15% of the item’s price plus $3.00 to handle and ship the product. Using Amazon’s service comes with a small cost, but considering everything you get using Amazon, it’s a small price to pay. What other costs are there to sell on Amazon? 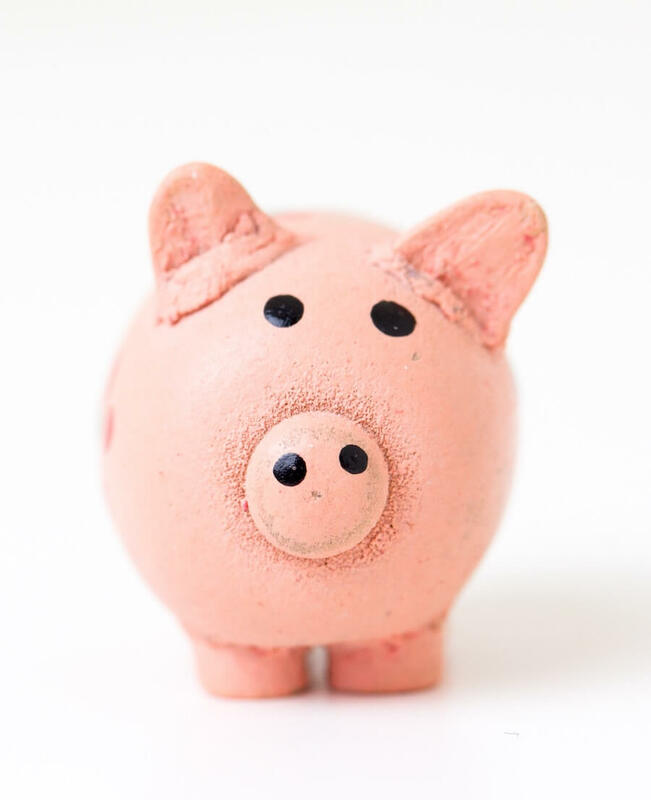 Oftentimes, there are “other” small costs that go unnoticed within each category, too. Think of returns (no one wants to think of returns, but here we are), disposal costs, shipping items back to you and write-offs. And then there’s the business costs, like insurance, payroll, taxes and travel. Some of them change and fluctuate, some of them stay the same. How do you keep on top of it all and make sure you know your exact outgoings and profits coming into the bank? 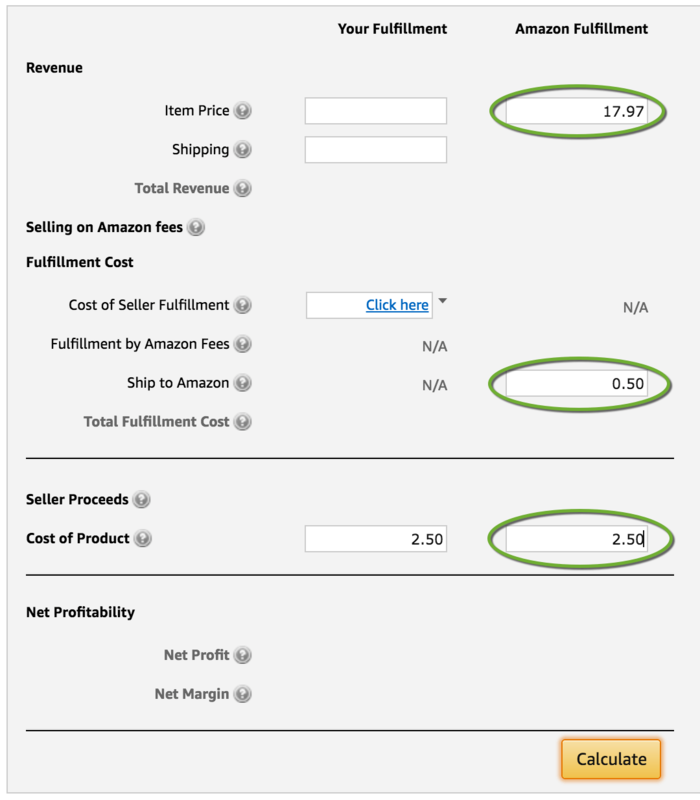 Amazon has a handy FBA calculator which is a useful tool for any FBA seller. This allows you to figure out how much you will be paying in fees to use the Fulfillment by Amazon business model for any given product. 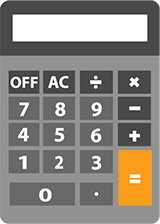 When you hit calculate, the tool will give you a breakdown of your Amazon Fulfillment costs, including selling frees and FBA fees. It will also show you your Net Profit and Net Margin (pssst… if we’ve lost you here, check out the Glossary at the end of this page). Obviously you can enter some rough estimates of the cost of shipping and the cost to manufacture the products if you are just looking for estimates. However, when you find a product that holds serious promise, it may be worth starting some supplier outreach, so that you can get a better idea of your costs per unit. 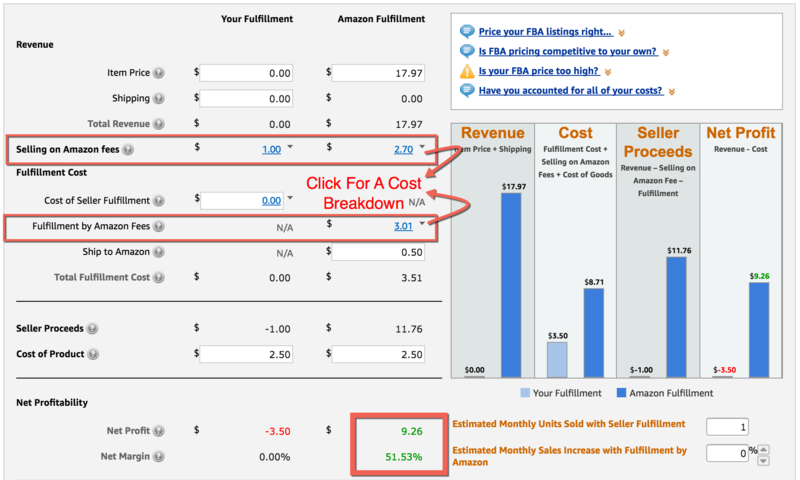 The FBA calculator is great (thanks Jeff!) for determining your FBA fees. But as we have already discussed, those won’t be your only outgoings. Many sellers have used this resource to get on top of their financials. It works similar to the FBA calculator, but allows you to enter all of your expenses to land on your Net Margin Per Unit. Any green figures are formulas, you can leave these ones alone. All figures in red you need to replace with your own information, or enter 0 if it is not applicable. Note: We have left some space for any additional costs specific to you, for example inspection costs, or returns. You can change the name of #Cost 1 and #Cost 2… or leave it and enter 0 if it’s not needed. Boom! Once you have done this you can hit save and revel in the knowledge that you understand your profit margins and how much money you are putting in the bank. Because after all, that’s what we’re here for, right? Tip: If you have several products, or want to run these figures each week or month, just create a new tab and copy all of the information in and start back at step one. Don’t have time to spend updating excel sheets and keeping track of all of your inventory, marketing and FBA costs? You could also automate all of this by using Fetcher – the leading Amazon FBA analytics tool for the serious seller who wants their accurate business metrics on the go! For a fine tuned business that doesn’t take wasted spend for an answer, how can you cut back on those costs? Part of the benefit of doing the exercises above is that you will be able to see right away what you biggest expenses are. There are always ways to optimize this in order to grow your bottom line, without even having to increase your sales. Here’s some best practice tips to take away! “I had a stockout” – said every Amazon FBA seller ever! Even the most experienced sellers get struck by a seemingly random bout of high demand, or difficulties with suppliers meeting timescales. But mostly, experiencing a stockout is due to bad planning and it can be prevented. It’s really worth preventing too, a stockout can cost you in several ways. On the other side of the coin, having too much stock can be costly too. You can end up paying high FBA storage fees, or even having to pay to ship the products back to you eventually. It’s a balancing act and it gets easier with experience. But if you want more tips and advice, check out Session #23 of the Million Dollar Case Study. And your enemies closer – watch your own sales like a hawk, but also keep two eyes firmly on the competitor. If they go out of stock, you might see a sudden spike in demand. 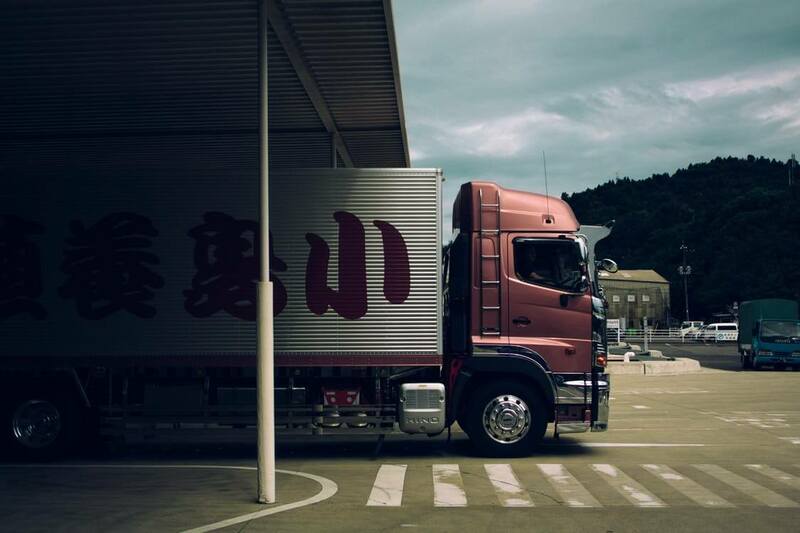 A strong supplier relationship comes in useful for many things, one of them being prioritizing your orders and getting them shipped on time. Also useful if you have an out of stock emergency and need to call upon a favor. If you are running out of stock you can increase your price to make it last a little longer and negate the negative fallout of a total stockout. You can also alter your pricing based on your competitor’s movements too. using Artificial Intelligence to increase profits, protect rank and protect you from a stockout! Returns can see an unwanted leaking of profit out of your business. Products can be returned faulty, or damaged. Some items are not able to be reworked, and if they are, there is a cost involved. Plus there is the collateral damage if your customers leave a negative review. Use automated emails using a service like Jump Send, to contact sellers who initiate returns. This allows you to try and resolve the problem and prevent negative feedback. Ensure you have an agreement with your suppliers to give you a discount on future orders for any faulty or defect sales. Sometimes products get damaged or never make their way to the customer, and sometimes the refunds for you as a seller never make it to your account. Keep on top of these and ensure you chase up any refunds owed. If you are seeing high returns for the same issue, try and resolve this with product updates and improvements with your next order. There’s nothing to stop you improving and evolving a product throughout it’s lifecycle. The Pareto Principle, or the 80/20 rule, would suggest that an Amazon seller makes 80% of their profits from 20% of their products. As you navigate your journey as an Amazon seller you need to be ruthless and sometimes make bold decisions. If an item stops selling and is costing too much in storage fees, or it’s a heavy item and the fees don’t justify the sales and profits, consider if it’s time to drop that item. 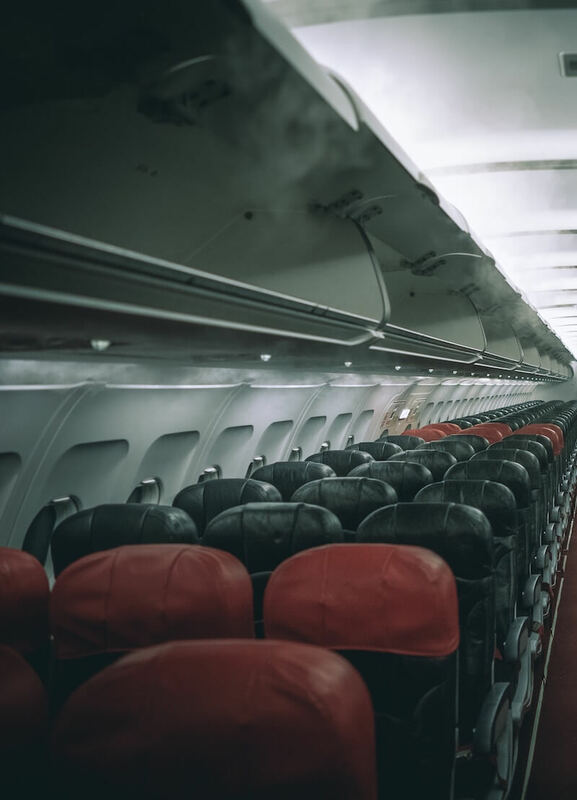 There are ways to liquidate stock and make back some of the initial investment which can then be put to good use to find and launch a better product. Sometimes you can squeeze more out of each product by ordering more inventory (if it makes sense to do so), in order to get the cost per unit down. 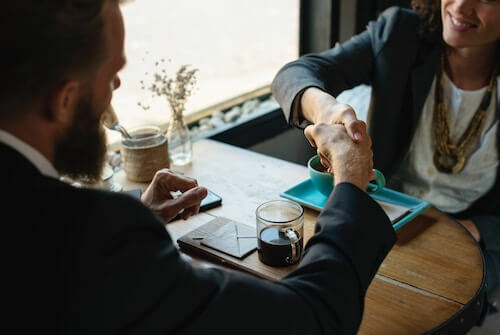 In addition, if you have a strong and especially long-standing relationship with a supplier, or source more than one item from them, try negotiating for a better cost per item. Another circumstance may be that when you were starting out you picked a supplier that isn’t quite up to standard, or is producing a product that you can get made for the same, or higher quality elsewhere. Assess these relationships frequently so that you know where to cut your losses and where to invest time in building a relationship that will benefit you. We covered some pretty heavy financial jargon and acronyms today. Just in case you need a reminder of what any of them mean, here’s a glossary to check back on. “Bestsellers Rank” is Amazon’s internal ranking algorithm that determines where your product listing will appear in the Amazon search engines. Many factors go into your BSR, including sales history, reviews, page views and more. “Cost of Goods Sold” are the direct costs of the production of the products, including the materials and labor. It does not include other expenses such as distribution or inspections. The cost to manufacture each unit of a product, not including any other costs such as shipping or customs fees. “Fulfillment By Amazon” – a service which allows Amazon sellers to send inventory to an Amazon fulfillment centre and let them handle the process of packing, picking, shipping and customer service for a fee. Gross Margin is the total sales revenue minus the cost of goods sold (COGS), divided by total sales. It is usually expressed as a percentage. The total cost to manufacture and import a product, including the manufacturing, transportations (over sea and inland), customs, duties, taxes, insurance, currency conversions, handling and any other fees. The amount of profit a product makes per each sale. It is calculated by taking the revenue from each product sale and taking away the landed cost of a product (per unit), plus any other costs (such as advertising). The process of locating an item in a warehouse, taking it out of the inventory and packing it, before shipping to a customer. This is a service that you will pay Amazon to do as an FBA seller. Pay per click advertisements – in the Amazon world it’s often referred to as Amazon PPC or Sponsored Ads. Amazon PPC allows you to advertise your product in the Amazon search results and you only pay if someone clicks on your ad and goes to your product listing. The price at which a product is sold to a consumer. When you run out of stock and are unable to fulfill any customer’s orders. On Amazon, your item will show as out of stock and consumers will actually not be able to order until the item is back in stock. Hopefully you feel more confident about managing your Amazon business financials now. These guides are great for those of you just starting out or launching new products, as well as those keeping track of an already flourishing Amazon FBA business. Don’t forget to download the free FBA profit calculator – you can use it time and time again!